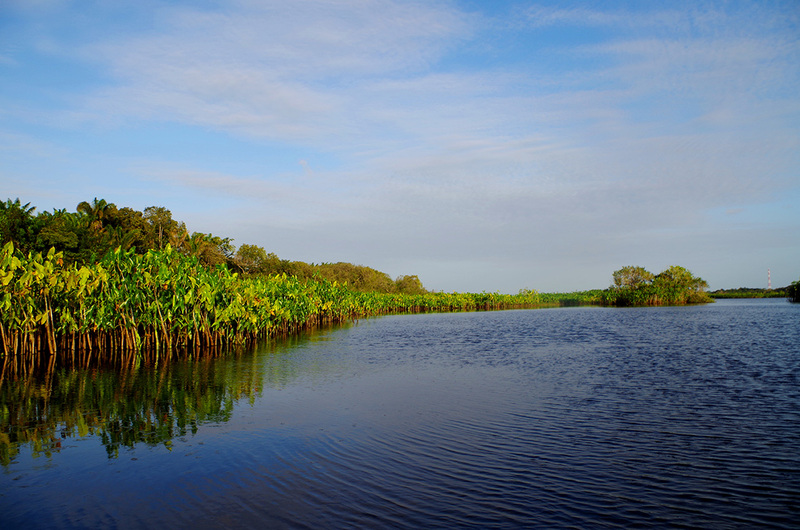 In French Guiana, a “pripri” is a marsh. This site’s name originates from the Sophie Family that held it, nicknamed “Yiyi”. The Pripris de Yiyi site is set within a large wetland of more than 49,421 acres, located between the estuaries of the Iracoubo and Sinnamary rivers in French Guiana. This natural site has been protected by the Conservatoire du littoral since 2006. The zone, recognized as a wetland of international importance by the RAMSAR Convention, encompasses a large variety of environments: mud flats, mangroves, savannas, swamp forests, marshes (known as pripris), etc. This area is also home to more than two hundred bird species, close to sixty fish species and a number of mammals, reptiles and amphibians. Since 2008, the Pripris de Yiyi site has been managed by the town of Sinnamary, as well as by the SEPANGUY association. Within the 2,471 acres of managed land, the small Pripris de Yiyi form a network of marshes that can be accessed by the general public. Visitors can thus discover the site and its riches by gliding along two nautical passageways in a canoe. The site’s riches have nonetheless been threatened for the last few years by the gradual closing of open-water areas. This is caused by the development of proliferating species, such as the moucou-moucou or water hyacinth. This invasion phenomenon entails major changes in the marsh’s hydrological functions, and in the long-term risks enhancing aggradation. In an attempt to restore this area of patrimonial importance, two weed-cutting campaigns were conducted a few years ago, using a backhoe installed on a barge. These operations were traumatic to the environment, which is why the town of Sinnamary – with support from the Conservatoire du littoral and SEPANGUY – decided to opt for a better-suited technical solution. With this in mind, the town of Sinnamary – in partnership with Europe, the Conservatoire du littoral, and the Heritage and Water Agency Foundation for French Guiana- launched a restoration program for the Pripris de Yiyi in 2013. 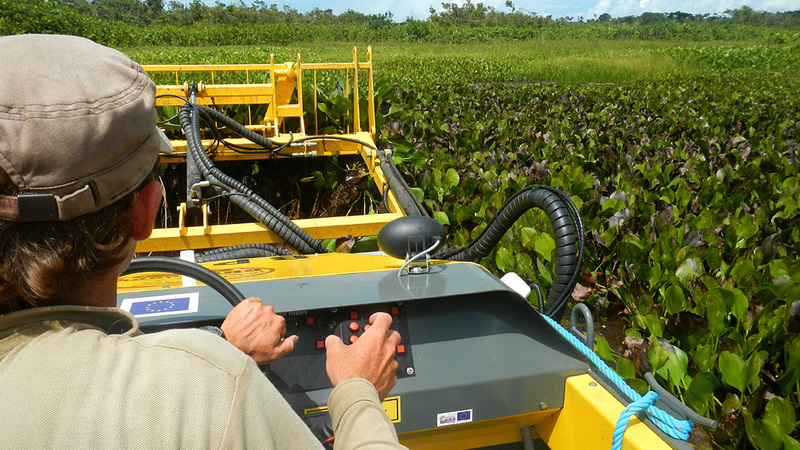 This program allowed for the acquisition of a small weed-cutting boat (or hydrostatic boat), that is soundproofed, has a shallow draft and shows close to no impact on the environment. This solution will help better manage the environment, by cutting away or ripping out the plants growing in the area. The treated areas will also be closely monitored, so the managers can adapt their actions to the results obtained. In addition to this project, the town of Sinnamary and the SEPANGUY association wish to develop new ways for visitors to discover the site, and to continue raising awareness among the general public.